Very Positive (338) - 81% of the 338 user reviews in the last 30 days are positive. Very Positive (15,126) - 80% of the 15,126 user reviews for this game are positive. Shake And Bake Is Back! On Tuesday, we mentioned that the 1.2.6 update would be delayed as the team ran in to technical issues with that content. After further review and investigation, the team has decided that the planned 1.2.6 update will instead roll in to the 1.3 update (which will contain all previously mentioned new maps). The goal at Tripwire and AMG is to always deliver updates that meet internal quality standards. If the teams are not satisfied on the quality of a soon to be published update then we know the community would be just as displeased. With that said, update 1.3 will be arriving in a few weeks time. We'll have more details to share with you as we approach the release date. We want to thank you, the community, for your continued patience and understanding. As such, we have activated the Double XP 'Shake n Bake' event for the weekend to express our gratitude. With this, the 12th free content update in 18 months, we are bringing you a long list of performance improvements, audio occlusion, new weapons for the North Vietnamese forces, new maps, new heads - and a specific community request. MP40 - the famous German sub-machine gun from WW2, issued to the NLF from Soviet stockpiles of captured weapons. 200-round belt for the RPD - this new variant will be selectable from the Role Select menu. Deployable DShK - players on the North Vietnamese team will be able to pick up a DShK 12.7mm heavy machine-gun from a resupply point, carry it to a new location and deploy it wherever they need it. The M2 Browning .50-caliber heavy machine gun will appear as a static support weapon in the new maps. A considerable number of performance improvements have been implemented for this update, to player characters, particle effects, level optimizations, changes to the Instanced Rendering system, a new set of weapon LODs and a set of changes to textures, with an emphasis on improving how texture streaming is handled. Mekong (remastered from "Hanto") - the NLF, fighting their way through the jungle to a US Marine Corps base. Dong Ha (remastered from "Guadalcanal") - a night-time assault by the NLF, through the jungle, against the outskirts of an airbase defended by the US Army. We have implemented a new system where gunshots and other ingame sounds are appropriately affected by their environment. This does not apply to all sounds in the game, but will affect any sound loud enough to be heard through walls, and be muffled/occluded by obstacles such as buildings or terrain. For a little more variety, we are providing you with 3 new heads for the North Vietnamese, plus 3 for the US Army and Marine Corps. The 3 US heads represent the diverse ethnicity of the US forces of the period, with one being Hispanic, one Native American and one Asian. And last, but by no means least, cinematics for the conclusion of a campaign! After we released the Multiplayer Campaign update, players requested suitable cinematic sequences for the end of a Campaign. You spoke, we listened, we agreed - so here they are! Help decide the fate of the war in Vietnam! Highway 14 - this massive map features the US Army fighting their way along a highway through difficult terrain, clearing objective after objective, with the NLF guerrillas trying to stop them. Tripwire traps and tunnel spawns can be placed in more surface types, making them more useful in urban environments - it just takes longer to dig in concrete! And, as a special request for a mapper, we have created a single sound effect for a clap of thunder, instead of the existing looping one. We hope you enjoy using it! Quang Tri: Set during 1972, Quang Tri is a daytime supremacy map set in the citadel of the provincial capital, pitting the new ARVN forces with limited US helicopter support against NVA main-force units. A Sau: Set on an airfield and fortified camp in the A Sau valley, this nighttime territory attack map finds ARVN forces defending against attacking NVA main-force units. Visibility is limited under the cover of darkness with occasional flares lighting up the battlefield. Firebase Georgina: Daytime attack by main-force NVA on a series of positions held by the US Army. Borderwatch: Australian forces attack territory held by the NLF (Viet Cong), pushing through jungles and across open fields to the VC’s final hidden base. Resort: US Marines stage a heliborne assault from the sea on a resort area held by Viet Cong guerrillas. Purchase the Digital Deluxe Edition and receive 2 character customization items, 4 early item unlocks and the Official Soundtrack. The Official Soundtrack made from original composed music will be available to Digital Deluxe Edition owners after the release of Rising Storm 2: Vietnam. Owners of Killing Floor 2 will receive 4 Vietnam-era weapon skins for the RPG-7, M1911 pistol, Lever Action Rifle and M16 M203. Rising Storm 2: Vietnam is the next in the series that has twice been PC Gamer’s ‘Multiplayer Game of the Year’, bringing the franchise into the era of automatic rifles, man-portable grenade launchers and more modern weapons systems. Still with the authentic look and feel and realistic weapon handling that the series is known for. And hundreds of character customization options. 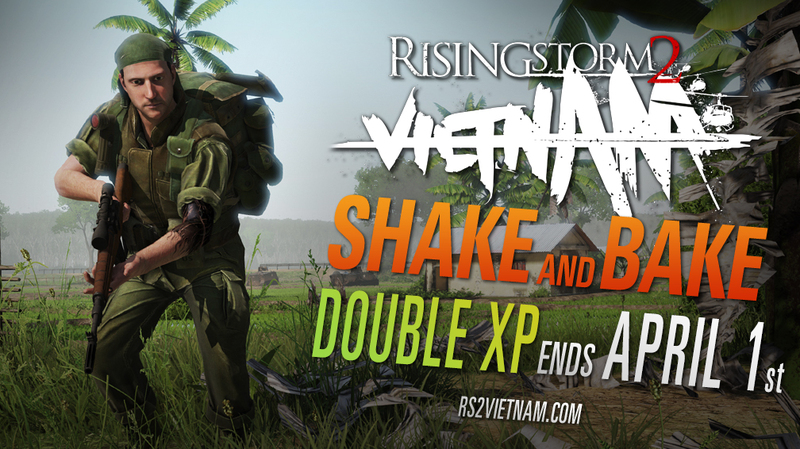 Rising Storm 2: Vietnam offers intense action for up to 64 players in battles between the forces of South Vietnam (the US and their Allies) and those of the North - the regular, main-force units of North Vietnamese Army, plus the guerilla fighters of the National Liberation Front (or Viet Cong). Tactically, the Southern squad leaders become important - so long as the squad leader is alive and in a smart location, the rest of his squad can spawn in on his location. So keep your squad leaders alive at critical moments! “Ambush Spawn” ability - the NVA/VC commander can also cause anyone on his team who is waiting, to spawn on his location for potentially devastating ambushes. Rising Storm 2: Vietnam ©2017 Tripwire Interactive. Unreal® is a registered trademark of Epic Games, Inc. Unreal® Engine, Copyright 1998-2017, Epic Games, Inc. This software product includes Autodesk® Human IK® property of Autodesk, Inc. 2017, Autodesk, Inc. Autodesk, “Autodesk® Human IK®“ is a registered trademark or trademarks of Autodesk, Inc. All rights reserved. 237 Curators have reviewed this product. Click here to see them.